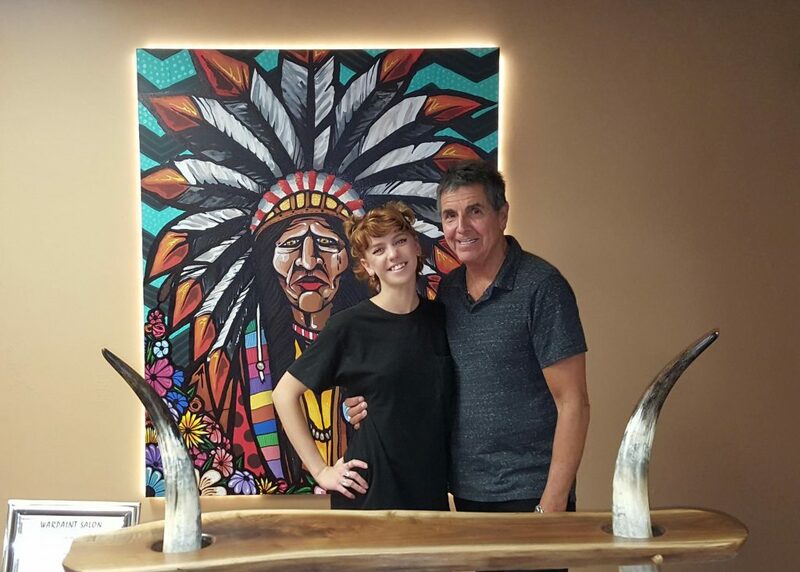 Clifton Chippewa and his assistant, Charlotte Hines, at his Warpaint Salon in Ann Arbor. You may not have heard of local hairstylist Clifton Chippewa, owner of Warpaint salon in downtown Ann Arbor, but Hollywood has. With 30 movies under his belt since 2002, Emmy-nominated Chippewa is often called upon when filmmakers come to Michigan, as well as other set locations around the country. Last year, he was called on to travel to Oregon to work on Reign of Judges: Title of Liberty, and he and his assistant, Charlotte Hines, went on location in December. Reign of Judges: Title of Liberty is a historical epic/period action film set in the New World against the backdrop of a war-torn indigenous nation. It’s currently in the stages of making a full-feature film and has made record-breaking ground on Kickstarter. In 2017, the movie concept gained enough ground in its Kickstarter campaign to fund filming the short, REIGN OF JUDGES: TITLE OF LIBERTY, the first Book of Mormon War Epic. The film short already has 256 Ratings on IMDb, with 9.6 Stars. The filmmakers wanted to have as much authentic Native American presence on the film as possible. When I asked Chippewa what interested him in working on this particular film, he said there was some initial ambivalence about the project because of the way Native Americans are sometimes portrayed in film. But the producer gave him full creative control. “We felt in this way, we could protect the way the Native Americans would be represented.” And so, they decided to create a fake tribe that isn’t distinctive of any specific tribe or region. Chippewa and Hines crafted various head dressings out of real bones, feathers and other natural materials and worked on some of Hollywood’s finest, including actors Ben Cross (J.J. Abrams’ Star Trek), Eugene Brave Rock (Wonder Woman), and Karina Lombard (Legends of The Fall). Other notables that worked on the film were David Atherton (from Oscar-winning Dances With Wolves) on makeup, and Kristi Hoffman (from Oscar-winning The Revenant) on costumes. 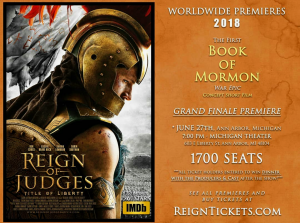 Moviegoers can view the short, REIGN OF JUDGES: TITLE OF LIBERTY, the first Book of Mormon War Epic, at the Michigan Theater June 27. Tickets are on sale now at ReignTickets.com. Ticket holders will be among the first to see the epic concept short film and behind-the-scenes footage. There will also be a question and answer session and photos with some of the cast and crew, followed by an opportunity to win dinner with the director and select cast members after the show.